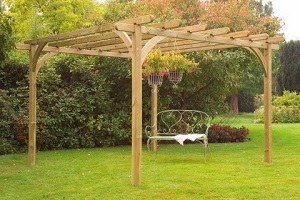 Ideal for climbing plants and to create a shady spot in the garden, we have an extensive choice of treated timber and metal pergolas. Manufactured to the highest standards in pressure treated timber, our range of pergolas are sourced from big brand names including Grange Fencing, Zest4 Leisure and Forest Garden. View our best-selling Forest Garden Radial pergola to enhance a corner in your garden or for the large garden, we recommend viewing our Grange Fencing Pod Pergola to create a garden feature for the neighbours to envy!